Step 2. grate coconut or I suppose you can buy it like that? Step 8. Add vanilla and lastly add your liquor and I supposed you can leave it out if you dont drink alcohol but that would defeat the purpose for me lol. wow I totally missed your comment! Umm I made a little over 2 pints because the bottles I used to store it were 1 pint each. That's about 20 oz So a gallon would be 6x that. You'll be making a lot! Good luck with the wedding ( I love weddings) and thanks for checking out the recipe. I just have a few questions on your recipe, hope you can help. 1-Do you use just the regular milk that we buy from the supermarket to boil it? 2-I'm assuming you live in the USA, where do you purchase the real Haitian alcohol? I usually use white rum (barbancourt) to make mine. 3-Does your recipe thicken without lime juice? I was thought that the lime juice is what thickens the kremas. 1. yes i live in the US and yes I use regular store bought gallon milk.I'm in Florida and use 2% Publix milk( red). None of that lowfat, skim business lol. 2. In most places, the closest you can find to the Haitian alcool is the 153 proof. I've also used a jamaican one that worked pretty well. I dom't have the name right now but i will update my post if I find it again. It also never hurts to check local Haitian stores if there are any near you. I never heard about zoranj sure in cremas, is it good? Wow! I followed your recipe and it came out great!! only difference I added an extra can of coconut milk and the 12oz coconut cream from Goya. It made it really delicous since I couldn't find real coconut in my area. My daughter who was born here made it with your recipe and she enjoy making it. She really felt Haitian and accomplished:))). Merci!! How do you store it.I want to give this as favors at my wedding .As a suprise to my fiance's family and friends. As part of my kitchen tradition, we always lick the nestle can after we pour the condensed milk. It's a Haitian thing in my home to do. Lastly, after you broiled the milk, make sure you eat the cream on the top, its great too hehe..Ok, my daughter and I who's 15 y/o we also fought for the cream, she refuses the smaller cream. Its one way to have fun in the kitchen with your children. how many cinnamon sticks and nutmeg? Thanks for the recipe. I remember every christmas, our job was to great the coconut and open the condensed milk not the evaporated, simply we used to find for the can to we could lick it...Lol. when I came in here, it was really hard for me to find the Haitien alcohol. I thank you so much for breaking it down for me step by step. Merry Christmas and have a prosperous year to all my Haitians folks!!! 1/2 bottle of the liquor mentioned above. I just finish making the cremas with your recipe and added coconut rum cream and it tastes excellent. Thanks a bunch and Happy Holidays!!!!! Yes do and let me know how it turned out! Hello: I m a fan of your truly. I have 2 questions today. I made some kremas, I had some with my family and save some in a bottle. few weeks later when I went to get some from the bottle, it was hard thick. why is that? my second question is can you tell me the recipe and how to prepare (douce lait)? it s a haitian goodies kinda like, douce kokoye or douce pistache, but not. Hi, i want to make this as a surprise to my parents ad well as share with my friends. I have a question that might sound stupid, but you never know. When leaving overnight, put in fridge right? covered? I am a Kremas lover. Your recipe is great and simple. Keep the good work. 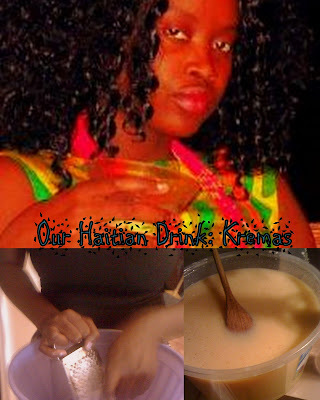 Would you happen to have a recipe for Haitian liqueur as well? Happy Holidays! Thanks. I followed the recipe, but in addition to the grated coconut I used a can of cream of coconut. I used all the thick cream on the top of the can and just a little of the liquid so it would not reduce the thickness much. Also I did not use any sugar just sweetened condensed milk(many like 6+ cans) They control the thickness so add until you reach your desired thickness. also I used about 3/4 of the amount of milk and used more evaporated milk instead. I also used clear Barboncout Rum. Almost the entire bottle. It reduces thickness quite a bit which is why I needed so many sweetened condensed milks. It was still not as strong as I would have liked so if you can find the overproof rum I recommend it. It will also help with keeping the thickness. FYI after 2-3 days of sitting on the counter covered my kremas got 3-4 times as thick :) keep that in mind when you make it. But I love it very thick. If I can't find the suggested alcohol am I looking for light or dark rum? S. Please I have a question.can you tell me if the cremas never split in two with your recipe, mean the cremas stays on top and the bottom looks like .lclear water and sometimes become hard, how long can we keep it? Thank you for posting your recipe but I just wanted to mention that you do not necessarily have to use regular milk... in fact I've never used it. All you need is evaporated and condensed milk, also you can use a blender to blend the coconut instead of grating it (less time consuming)...blend the coconut with evaporated milk, squeeze the milk out than rinse it with alcohol. Stir it very lightly once the alcohol is added , if needed, another table spoon of lime juice can also be added to maintain thickness. Also, I use a very thin material (grepe) to strain my cremas. I've use it at wedding receptions as gifts and people always like it. WOW... your recipe is awesome! (I always like to see how it used to be made) but it's too time consuming for me... 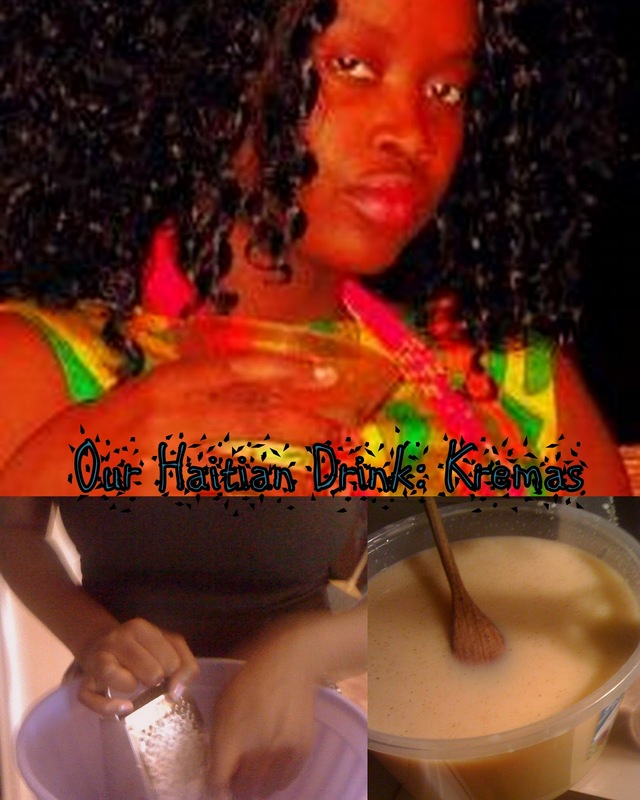 I'm lazy, LOL I found a recipe in a Haitian cookbook that everyone loves!